UPGRADE WITH THE OTTAWA BASEMENT RENOVATION PROS! 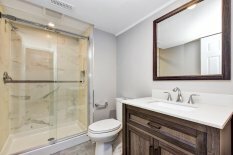 Are you interested in a brand new basement bathroom? We can help you turn your design ideas into reality with our bathroom renovations	using only the best products and best know-how to build it to last a lifetime. Our team at OttawaFinishedBasements.com is committed to providing the very	best in renovation design and construction. With our teams’ over	10 years of experience in the basement renovation industry, we have extensive	knowledge and expertise that you can rely on. To help you get started on your remodeling project, we can offer you a	design consultation	at no charge. As Ottawa basement renovation experts, we can handle the design, build,	and renovation of every aspect of your basement! Give us a call at (613) 627-3410.